So, now that I have settled into my new work “home” in Kendall Square, I think it is high time I share some of the amazing food I have been eating on this side of the river. This may be a Boston foodie sin, but I admit that before this lunch I had only been to Flour Cafe + Bakery twice. Both times I indulged in the brioche al sucre…which is unbelievable! But the prowess of Joanne Chang is world renown, so I won’t go into that. The big question is, how is their lunch? Luckily Liz of Eating Places joined me for lunch, so we were able to try out 2 of the amazing sounding sandwiches on Flour’s menu. Roasted Lamb w/ tomato chutney, goat cheese and greens – This sandwich was a perfect combination. The lamb was sliced almost paper-thin, and the play of the tomato chutney and goat cheese gave it a tang while also keeping a delicious richness. This sandwich was also much lighter than I thought it would be. 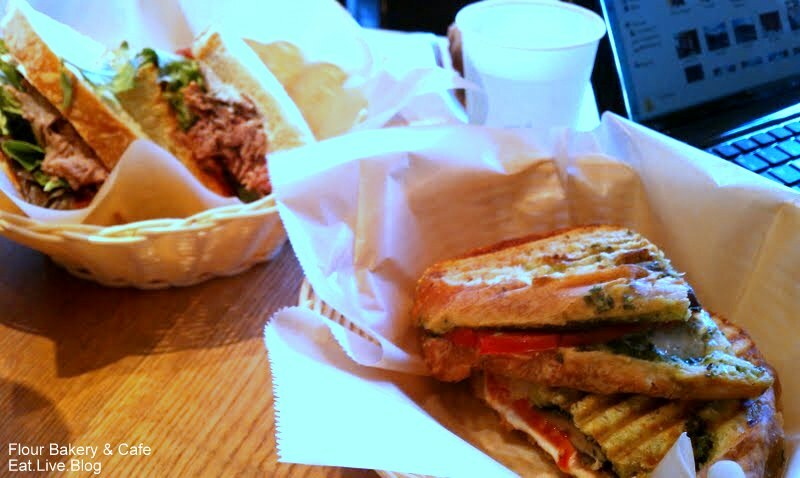 Grilled Portobello Melt w/ mozzarella, roast tomato and basil pesto – This sandwich was actually heavier than I expected….and more delicious than I expected. Served Panini style, the flavors melded together for something unexpected and amazing. However, because it was heavier than expected, I would not have been able to eat an entire one of these, the half was perfect. Overall, Flour 100% met my lofty expectations. I look forward to working my way through the entire sandwich selection! This entry was posted in Reviews and tagged cambridge, flour cafe, joanne chang, review by reneeh. Bookmark the permalink. My mom loves the lamb sandwich and requests we go to Flour to get one any time she’s in town. I love the BLT and tomato-mozzarella sandwiches, but I’ve tried almost all of them and have enjoyed every one I’ve had.